In a deep non stick pan, heat ghee and fry the precooked shredded beets, keep frying till it releases a lovely aroma around 5-6 minutes. Now start adding the jaggery and let it melt and keep stirring until well combined, check for sweetness and let it cook for further 5 minutes. beetroot and jaggery unusual combo , taking halwa to another level ,thought not a great fan ,tempts to try it . Looks yummy...and they are perfect clicks!! looks so delicious! !hw it tasted?i mean had u noticed any raw smell of beet? Healthy and delicious..loved the addition of jaggary in it!! It looks great! Never tried beet root halwa before. i love this and make it often but with sugar addition of jaggery is nice! I love beet for its colour,it looks so delicious...loved ur clicks!! 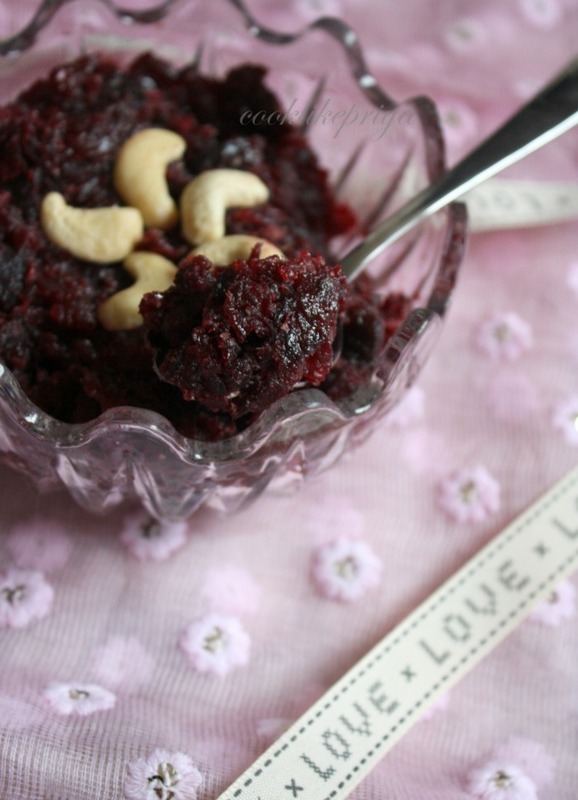 perfect dessert for valentine's day :) the color creates a mood..
beets halwa with jaggery,sounds interesting n a healthy option too...halwa looks so delicious...lovely pics dear! liked ur new header..U Rock!! I usually use those precooked beets for making smoothies. Like this idea too Priya... BTW like your new header..very stunning. 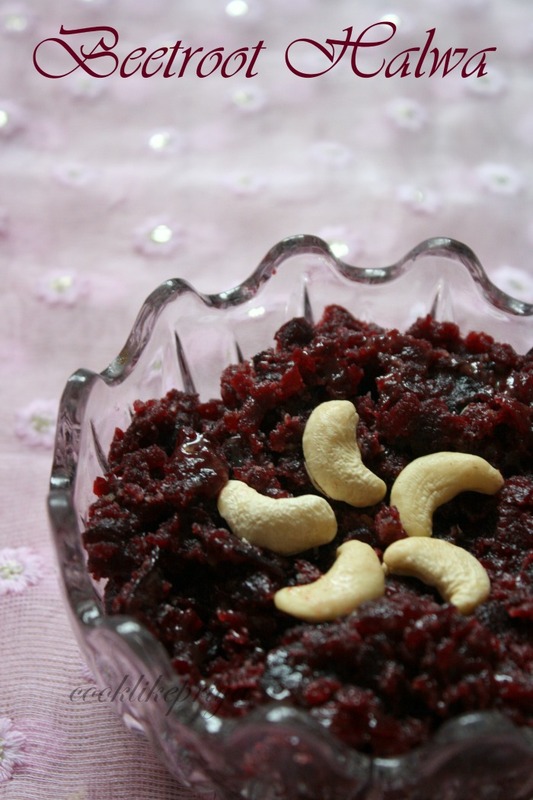 Beetroot halwa is superb. 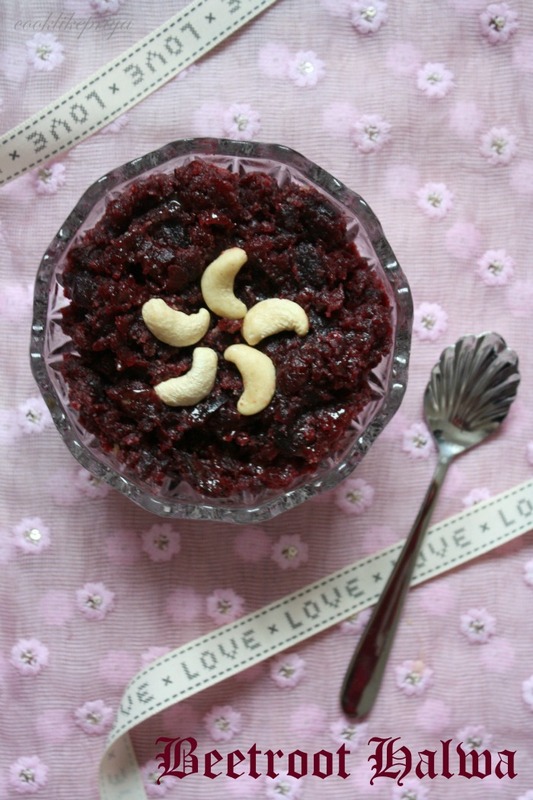 you are tempting me a lot with these clicks of the yummy beetroot halwa. I have never tried adding jaggery to halwa. would like to try sometime. Jaggery in halwa thats sounds wonderful sis,wat an healthy twist,loving this addition here Sis..Love to finish that whole bowl.